This Prima Balerina cake was a cake for a first birthday for a little girl named Penelope. She was darling!! I started my cake with a 10 inch base topped with a 6 inch top. This design was completely my own creation. The first tier I frosted in butter cream and smoothed with Viva paper towel. This really gives a great smooth finish on a crusting butter cream icing. Then I placed my 6 inch on top. I went over the 6 inch with a 2D tip making a rose swirl. I had bought the tutu with bodice from ETSY (they have the best decorations to put with your cakes! cheap too!). The tutu with bodice was attached to a wooden rod that went down thru the center of the cake. I cut roses from fondant using my Wilton rose cutters and set a group of 3 roses to the side. I purchased a brooch (which was the size of my fist) on eBay ($8) and covered the back with fondant using royal icing to stick to the cake. On each side of the brooch I placed a rose. On the middle right, I made tiny ballet shoes from fondant, using my ball tool to hollow out the inside of the shoes. I placed a tiny rose on the shoes and secured laces inside the shoes. I made the roses about 2 days in advance. The ballet shoes were a quick add-on at the last minute. 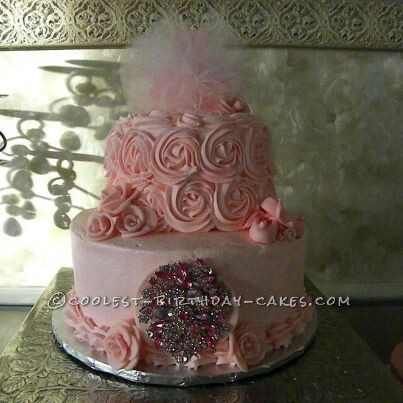 You can imagine how gorgeous this blinged out cake was on a pedestal cake stand!